The authors estimate that the proposed modernization of the Cuban road system would probably support other crucial social and economic savings when traffic demand will grow, including improving the highway safety services, implementing clean and cost effective urban and inter-urban rapid bus services that support reduction of CO2 and other transportation related contaminants, improving the pedestrian, bicycle and other non-motorized traffic, and optimizing the life cycle costs of road investment and maintenance programs. The authors have concluded that the road authority of the new Cuba could meet donors’ conditionality during a short and peaceful transition and sector modernization periods of approximately six to nine months and could start the implementation of a 15–month and a $24 million (M) accelerated road improvement and sector modernization programs. This conclusion goes in tandem with the latest announcement of the acting Cuban president, Mr. Raúl Castro, published in The Washington Post (July/26/07, “Cuba’s call for economic détente”) and indicating that Cuba is considering opening itself further to foreign investments of capital and technology and U.S. might play a role in a new Cuba. Cuba’s strategy for its economic development is in the process of reformulation and the “grand design” that predominated since the ending of the special relationship with the former Soviet Union has essentially been terminated.3 The basic features of the new Cuban economic strategy include the generation of foreign exchange earnings now emphasizing exports of nickel, medical and educational services, and, in time, perhaps oil. Modernization of the management of the Cuban road systems would contribute to the reduction of the overall road transportation costs, including vehicle operating costs and will support the Cuban foreign exchange earning strategy. Lessons learned from international donors such as the Inter-American Development Bank (IADB) and the World Bank (WB) show that modernization of roads management would probably support other crucial social and economic savings when traffic demand will grow, during and after the transition period, including improving road safety services, implementing clean and cost effective urban and inter-urban rapid bus services, improving pedestrian, bicycle and other non-motorized traffic, optimizing road improvement and maintenance services and keeping low CO2 and other transportation-related contaminants. 3. The estimated cost of the proposed road safety, urban transport and institutional modernization studies of the Cuban ministry of transportation- MITRANS is $2.4 M and the implementation period is estimated at 6 to 9 months. Lessons learned from LAC and Asia indicate that these studies are needed in tandem with the accelerated road improvements and maintenance works to optimize the expenditures of MINTRANS, sustain the future effective and safer road services and attract institutional and financial support of international donors, including the WB and IADB. The area of the Cuban island is approximately 44,206 square miles (110,860 sq. km. ), about the size of Pennsylvania.5 The Cuban population is approximately 11.4 million, close to the Pennsylvanian population of approximately 12.3 M. The total mileage of the Cuban road systems is over 18,750 miles (30,150 km) including 16,000 km of paved roads. Approximately 53% of the Cuban road networks are paved and the road density is 2.64 km of roads per 1,000 persons, or 272 km per unit area of 1,000 sq.m. (see Table 1). Nearly all Cuban cities, towns, airports, harbors, and agricultural areas are accessible by paved roads, and there are approximately 677 km of completed expressways (4 lanes or more) and 114 km of expressways in construction or near completion. In comparison, the length of the Pennsylvania road networks is approximately 116,016 miles (186,554 km), or 1567 km of roads per a unit area of 1,000 sq. km. (see Table 1). The distance between the eastern and western extremities of the Cuban island is approximately 1,200 km, connected by the main Cuban highway between Pinar del Rio and Santiago de Cuba. The highest mountainous top is approximately 2,000 meters (6,000 ft.) above sea level, located in the southeast of the Island. Seventy percent and thirty percent of the Cuban population, respectively, live in urban and rural areas with a high literacy rate of 97%. 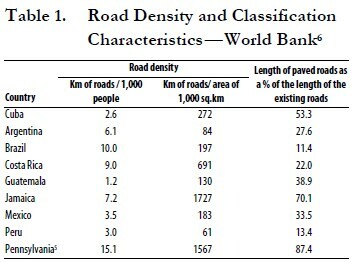 Table 1 compares the road density and road surface-paving density ratio in ten countries.5, 6 Table 1 indicates that the Cuban road density is not surprisingly far behind the road density of the state of Pennsylvania, but similar to the road density rates of Guatemala, Peru, and Mexico of 1.17 to 3.51 km of roads per 1000 people. Nevertheless, in terms of paving ratio, Cuba is more advanced with 53.3% of paved roads that provide adequate accessibility to all the seaports, ports, major production centers, and nearly all Cuban cities, towns, airports, harbors, and agricultural areas. In comparison, Guatemala, Peru and Mexico have only 13.3% to 39.4% of paved roads that carry more traffic volumes than the Cuban roads, but do not serve many townships or other social and economic centers. • Definition of the problems that the project will solve, such as reduction of transport costs and fewer accidents, and the sectoral context of the project implementation and operation, including a commitment of Government to provide adequate funding for maintenance and road safety services. • Determination of the root causes of the problems, including insufficient investment and maintenance funds, ineffective institutional capacity, and insufficient community and road users’ participation in the project planning and implementation stages. • Identification of the stakeholders who would benefit from (road users), or be harmed by the project (affected communities), and provision of adequate and affordable mitigation procedures. • Determination of the project dimensions, socio/ economic ranking and priorities, demonstrating that the proposed project is a clear priority in relation to other road needs and Government is committed to provide enough political support. • Provision of a project level detailed financial and socio/economic viabilities, demonstrating that the project is viable (high financial and socio/ economic values of net present value and economic returns) and affordable with reliable financing for the construction works and for the future maintenance activities. • Verification of the project’s internal and external consistencies, demonstrating that the project is consistent with the multi-annual macro-economic framework of the ministry of finance and considered a priority within the overall inventory of the country’s projects, not only the road sector. • Incorporation of lessons learned from international best practices of road and bridge modern planning and design tools to optimize the life cycle costs of construction, maintenance and operation expenditures. The authors estimate that the road authority of new Cuba could meet donors’ conditionality during a short and peaceful transition period of approximately three months and could start the implementation of a 15–month and a $ 24.0 M accelerated road improvement program using the engineering tools and related lessons learned described in the following sections. • Periodic maintenance is defined as investments that extend the life expectancy of a roadway and have a life expectancy of from three to seven years. It includes the improvement of ride quality and possibly pavement strengthening with at least a double surface treatment and usually a thin overlay of 3 to 6 cm of asphalt concrete (AC). It may also improve the drainage conditions and safety. • Rehabilitation has a life expectancy of seven to ten years. This is because materials, traffic, and environmental considerations in developing countries generally do not allow a life of more than ten years. It includes thick overlays with preparatory road surface repairs and improvements and, if feasible, restructuring of the original characteristics of the road. These investments require more detailed engineering so a level of service as near as possible to a new surface can be achieved. These will include restoration of all safety aspects and may include localized geometry changes when necessary, as long as it does not cause any environmental impacts. • Improvements include pavement widening for safety or congestion reasons, realignment to achieve safety goals, and pavement strengthening. These generally achieve a life expectancy of 10 to 15 years. The expected life is usually closer to 10 years (the lower level) due to materials, environmental, construction quality and other constraints. • Preventive maintenance includes larger maintenance treatments such as Chip seals, thin overlays, machine patching, and other more substantial treatments that extend the life of the pavement and drainage elements for a period of 5 to 10 years and bridges from 10 to 25 years. These treatments may be programmed by pavement management systems. • Rehabilitation involves major treatments such a thick overlays and milling with overlay. Such treatments are intended to restore lost structural strength and add significant new life of 10 to 20 years, and bridges from 10 to 50 years. • Reconstruction includes major works in which the entire structure of the road is reworked in order to ensure a new pavement and drainage service life of 15 to 20 years and bridges 20 to 100 years. Reconstruction also includes roadway improvements to improve safety or alleviate congestion including realignment and widening. Modern planning and engineering tools: Lessons learned from Peru and other LAC countries indicate that modern engineering tools are very useful to accelerate functional and structural evaluation of road and bridges. The online-GPS-GIS-multimedia road and bridge inventory and condition assessments system was very useful to accelerate the evaluation of the functional and structural characteristics and conditions of the 900–km Peruvian road corridor from Lima (Pacific Rim) to Pucallpa, located in the Amazonas region, the engineering evaluation and design of this road was financed by USAID. 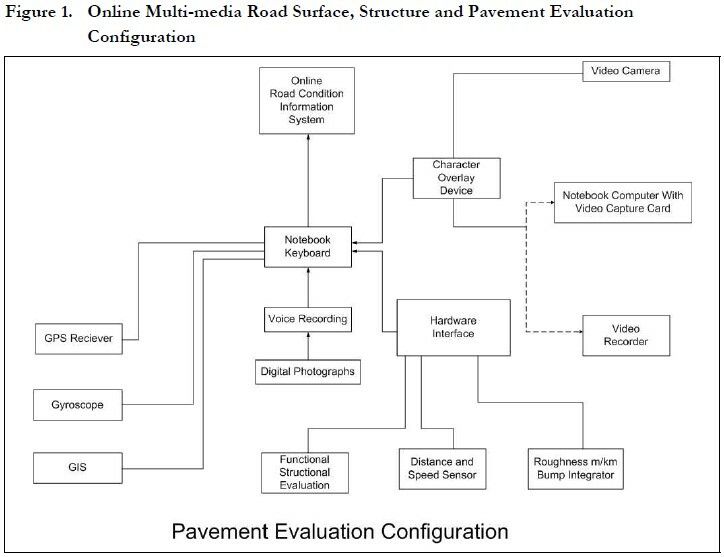 International donors recommend that online multi-media road functional and structural evaluation devises include (see Figure 1): (1) a video camera system, usually with 3 to 4 cameras, and voice recording hardware and software equipment; (2) a Bump Integrator to measure the road surface roughness, in units of m/km (see Figures 1 and 2), and a road condition information system that determines and records other road surface defects; (3) Gyroscope, GPS and GIS integrated systems; (4) notebook computer with video capture cards and distance-speed sensors systems; and (5) a laser-guided surveying equipment that measures other road’s geometric characteristics and surface defects, including rutting and roughness. The recommendations of The Little Book of Roughness19 (see Figure 2), are universally used by all donors. This book indicate that paved roads in good to fair conditions should have IRI values of less than 3.0 m/ km, and old roads with IRI of over 4.0 m/km with surface imperfections including minor but frequent depressions/defects need urgent periodic maintenance works to avert costly reconstruction works. The normal and safe traveling speed is greatly affected by road surface roughness, as an example the traveling speed is reduced approximately from 100 km/h to 60 km/h when the roughness is increase from 4 m/km to 10 m/km. Roughness values of over 4.0 m/km affect vehicle operation costs and road sections with high roughness values could be considered by donors for improvement if the HDM- 413 program indicates that they are priorities. The equipment devices of the online-multimedia road and bridge inventory and condition assessments are mounted to a vehicle that travels at a normal speed and gathers and records the road characteristics and conditions. Occasionally it is necessary to stop and survey structure defects of bridges, culverts and other drainage facilities that are hidden from the road surface and special video recording under the bridge or inside the culvert are needed. The productivity of one team, usually one driver and one technician is approximately 200 to 400 km per day. The authors recommend using the HDM-4 program to select and design of approximately 100 km of priority paved roads that need urgent improvement works.1,2 The HDM-4 will evaluate the: (1) the functional and structural deficiencies of the Cuban pavement and road systems; (2) projected traffic volumes and axle load characteristics; and (3) financial, social and environmental constraints,1,2,26,27 to determine the most feasible and affordable road improvement works. The authors estimate the planning and design fee, for the 100 km priority roads, at $1 M, and its accelerated implementation costs at $18 M (see Table 2). The duration periods of the design and construction activities are estimated at 6 and 9 months. • Quantitative evaluation of the road and bridge characteristics and conditions, using the modern video logging inventory described in the previous section, in order to determine the extend and the severity of the existing distresses that need urgent remediation works. • A system for monitoring and evaluating road maintenance activities. 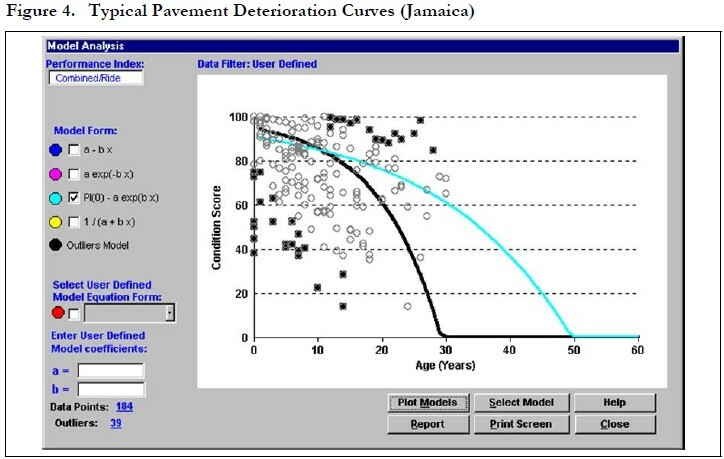 Network Level Routine Maintenance Planning Model: Prediction models of pavement performance are used to estimate pavement deterioration and distress development.10 to 13, 18 Figure 4 presents typical prediction of pavement deterioration curves from Jamaica. 12 The deterioration curves indicate the projected pavement conditions in terms of conditions scores from zero to 100, following the scale of the Pavement Condition Index (PCI).18 Pavement conditions score of over 80 indicate good road surface conditions with roughness values (IRI) of less than 2m/km to 3m/km and conditions score of less that 40 indicates very bad road surface conditions with IRI of values of approximately over 5.5 m/km. Engineering decisions trees are used to select investment programs in terms of all periodic maintenance as well as major work (rehabilitation and reconstruction) required, and determine the scope of routine maintenance works.11 to 13 These can be summed to develop overall needs and estimate the ‘desirable’ level of funding for pavement maintenance (and improvement). This is supplemented by minimization of lifecycle costs to ensure that maintenance and invested funds are properly accrued for any given network level of service in terms of surface conditions and highway safety conditions. 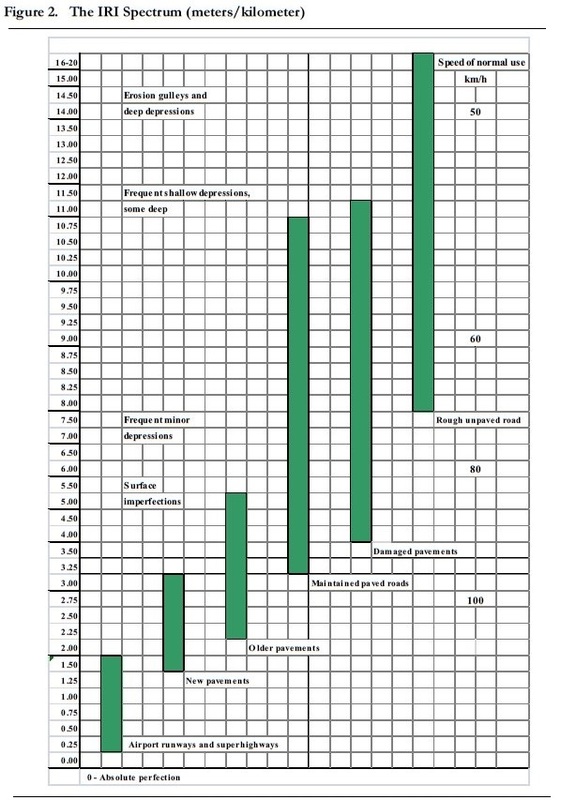 An example of minimization of road investment and maintenance life cycle costs is given in Figure 5. This figure describes the optimal case of total transport cost including: (a) the capital and recurrent expenditures of Government (GOC) and (b) the road user’s costs. Good road conditions with IRI of less than 3 m/km are associated with low user’s costs and high GOC costs and vice versa. This can establish the baseline from which the minimum acceptable funding and finally the affordable level of funding may be estimated. A general network level life-cycle cost analysis is used to estimate the minimum acceptable funding such that a structurally sound road will transition to a structurally damaged road if the routine maintenance actions are not accomplished. Likewise, all critical safety related maintenance is included. 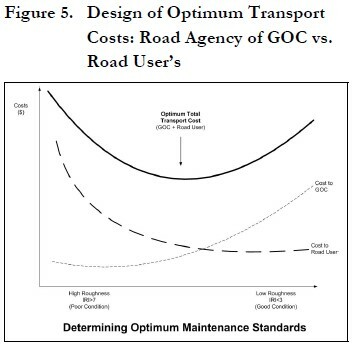 Desirable Funding (Optimum Level of Service): The desirable level of funding generally addresses all maintenance needs and minimizes life-cycle and road’s user costs, as shown in Figure 5. It includes routine maintenance activities such as surface treatment, thin overlays, shoulder repair, patching, and crack sealing. Desirable funding levels always program these maintenance activities in a timely manner to maintain low distress severity levels and low user’s costs. Also, application of the desirable maintenance service levels will defer needs for pavement strengthening, rehabilitation, or reconstruction. Under desirable funding, the level of service is maintained at a high level (e.g., roughness IRI value less than 4 for all roads and less than 3 for major roads). Affordable Funding (Reasonable Level of Service): An affordable level of funding is usually less than the desirable level but should be as high as possible within available budgets. Investment activities should at least ensure a five year life expectancy under routine maintenance management with no pavement strengthening. This will provide as much maintenance as a limited budget will allow. The entire network can be maintained somewhat above the minimum level of service with or a decision is made to maintain a reduced portion of the network at the optimum service levels obtained under desirable funding. Minimum Acceptable Funding (Minimum Level of Service): The minimum acceptable level of funding defines the maximum size of network dimensions where the surface distress severity varies between a medium to high degree, while the total distressed area is below a set maximum allowable level. The rate of deterioration is still being controlled to some extent, but road surface roughness is often above 4 m/km and rehabilitation and periodic maintenance works are needed. Distresses do not exceed the allowable maximums and high severity does not exceed 50%. The maintainable network starts to be reduced when funding drops below this amount. The level of service in terms of roughness will usually be IRI greater than 4.0 m/km and less than 6.0 m/km or less than 7.5 m/km in poor and post conflict countires.8 Under the minimum funding scenario, although the distresses are still being controlled to some degree, rehabilitation or reconstruction will definitely be needed in a relatively near term (e.g., 1 to 5 years). In other words, low level routine maintenance funds are shifted to a high level of expenditures of rehabilitation and reconstruction work (investment program) that could provide life expectancy of 7–15 years with affordable and desirable road maintenance funding. Model of Routine Maintenance Programming —Project Level:10 to 12 The project level programming model determines priorities of actual maintenance project work in terms of actual quantity, schedule, and activity by project location. This analysis provides the monthly and weekly work program to address the specific pavement distresses and maintainable elements for any given level of service and quality assurance procedures. The project level program includes quality assurance and quality control (QA/QC) procedures to evaluate, accept or reject maintenance works. A cost formula is used to acknowledge actual quality of pavement conditions vis-à-vis QA criteria in terms of measured extent and severity of representative pavement distresses; roughness, potholes, rutting, shoulder drop-off, drainage conditions, and cracking. Higher levels observed in the field trigger higher needs, in terms of cost to repair. This can also be used to flag poor quality work. Model for Maintenance Effectiveness: The effectiveness of maintenance depends on several factors including the budget, productivity of the maintenance activities, materials, procedures, prior conditions, elements maintained, and the environment. The maintenance effectiveness model defines the benefit of maintenance in terms of improved performance and the diminishing returns of these benefits as the original condition of maintainable elements drops below some maintenance threshold criteria. At these levels, if funds are available programming for rehabilitation or reconstruction by the HDM-4 becomes the most cost effective option.10,12,13 The RMMS is used to determine the dimension of the reduced maintainable network, identified roads that local communities and users would have to maintain in accessible conditions. Therefore, the authors recommend using the HDM-4 and the RMMS programs to optimize the selection, planning and design of priority road investment and maintenance works, Table 2. Model for Reporting: The reporting module provides standard graphical reports indicating what actually was accomplished including costs, quantities, and productivity. Reporting goes to all levels and includes budget, level of standards, network planning, project planning, level of service, quality assurance, lessons learned etc. The reports cover multiple levels of management including the administrative level, engineering level, and maintenance superintendent level. Selected Road Maintenance Program: Lessons learned from accelerated maintenance projects in LAC and Africa8 to 12 indicate that international donors could support a fast track road improvement and maintenance works, if: (1) detailed designs of road maintenance programs are developed, using the HDM-4 and the RMMS programs; (2) Government modernizes the road sector, and the procurement procedures are effective and transparent; (3) the road agency implements modern design tools and transparent QC/QA procedures. The authors estimate that a new Cuba road authority could meet donors’ conditionality during a short transition period of 3 months and use the RMMS and HDM programs for approximately 6 months to design an accelerated 500–km road maintenance program. The design and the implementation of the maintenance works are estimated at $600,000 and $2.0 million. Institutional responsibilities and possible assistance and training needs: The Cuban Ministry of Transportation (MITRANS) is responsible for directing, executing, and controlling the application of government policy in matters involving land, maritime, transportation or connected services, and civil maritime navigation.1, 2 In the road sector, MITRANS is responsible for the planning, development activities, environmental protection, issuance of transport service licenses, security of all transport modes, road maintenance and safety services. The authors estimate that if requested by a transition government of Cuba, international donors including the U.S. Department of Transportation (DOT) and specifically the Federal Highway Administration (FHWA) could provide immediate assistance to support the capacity building of critical technical and institutional activities of MITRANS, including: (a) implement priority and urgent road improvement and maintenance works using the HDM-4 and RMMS programs; (b) implement innovative engineering technologies, including online multi-media video logging of road evaluation services, non-destructive testing of pavements; (c) design and implement transparent and modern services of quality control and quality assurance procedures of road construction and maintenance works; (d) improve road safety services; (e) improve engineering preparedness of MITRANS to minimize damages to roads and seawalls from future hurricanes storms;9, 28 to 30 (f) promote private sector participation in road investment projects or in possible new concession projects and leverage donor’s financial and technical support; (g); promote innovative procurement procedures such as performance-based-lump-sum road construction, maintenance and supervision services to encourage cost effectiveness and reduce cost overruns and implementation delays; (h) implement risk sharing procedures for public-private sectors partnerships of road investment and maintenance projects; (i) promote the use of community-based micro-enterprises for road maintenance works; (j) develop reference baselines for competitive construction and maintenance unit costs to attract international bidders, support the development of infrastructure market economy, break local monopolies and promote transparency; and (k) promote engineering initiatives to protect the environment and support energy efficiency for road construction and maintenance projects. Institutional considerations of construction and maintenance quality procedures: Donors and LAC countries give high priority to quality, social and environmental conservation, ethics and transparency of road construction and maintenance works.7 to12, 17, 26, 27 Donors define quality as the responsibility to deliver safe, on time and effective road services to the taxpayer and user and associate this responsibility with quality assurance (QA) programs. Quality assurance refers to all the institutional activities necessary to verify, audit, evaluate and implement road quality services. It may also refer to the quality of data collected for use in the HDM-4 and RMMS road maintenance management systems. To obtain a reasonable degree of QA, cost effective and affordable design standards and specifications acceptable to the users and affected communities should be developed for the project specific characteristics and conditions. QA procedures are adjusted to the inherent variability of construction conditions and local soils and material characteristics, sampling and testing guides, and maintenance standards. Recipe specifications: Also referred to as method specifications, describe what is wanted and how it is to be obtained. For an asphalt pavement, the engineer would specify fatigue characteristics, stability, workability, air voids, durability, surface smoothness; plasticity, gradation and other requirements of the quality of materials; the general types of equipment to be used; and hauling, placing, rolling and degree of compaction. Presently, recipe specifications are used in the cost plus fixed fee road construction and maintenance contracts and are primarily developed by experience. Disadvantages of recipe specifications include: (1) natural product variability is not adequately accounted for; (2) little or no recourse is available if the specifications were followed but the results were unsatisfactory; (3) material sampling often does not yield a statistically significant or reliable result; (4) little opportunity or incentives for innovation is allowed on the part of either contractor or engineer; and most important (5) most of the project implementation risks lie with the public sector road agency. Advantages of recipe specifications include: (1) the inspectors and contractors involved with construction are familiar with the specifications; (2) they are relatively easy to understand; and (3) clear guidelines are provided for those who are inexperienced in planning, supervising, and inspecting construction activities. Performance-based specifications (PBS): Also referred to as end-result specifications, describe what the product is and what are its performance characteristics, QC/ QA criteria and implementation procedures. PBS describe how the completed product must perform. In the case of road pavement construction works, the PBS would describe the allowable maximum severity levels of the road surface defects (such as potholes, cracking, breakup, rutting and roughness) during the project operation warranty periods and its lifetime, before a next cycle of pavement rehabilitation, usually 7 to 12 years and 3 to 5 years for well maintained paved and gravel roads. PBS give the contractor considerable freedom in choosing how to satisfy the requirements. With PBS, the primary responsibility for quality control is placed on the contractor. The engineer/ supervisor monitors the contractor’s quality control, and accepts, rejects or adjusts the work and the contractor invoice according to contractual pay equations and value engineering procedures included in the bidding documents of the project.9, 10, 31,32 PBS are statistically oriented and are based on random sampling techniques, with acceptance on a lot by lot basis (a lot being a given quantity of material, i.e., 1,000 tons of implemented granular base course or asphalt concrete paving materials). Disadvantages of performance specifications include: (1) full implementation requires good engineering knowledge of statistical procedures and engineering expertise associated with continuous training, on the job or in special training courses; (2) continuous research and performance monitoring of material characteristics variability and changes of projected traffic loading that may affect the road pavement performance and may modify maintenance needs, such as pavement resurfacing versus grading of gravel roads; (3) the additional responsibilities placed on the contractor could result in higher bid prices, however the authors experience indicates that in competitive procurement conditions this possible higher cost is insignificant; and (4) the lack of specific “how to” specifications require experienced and competent inspectors and contractors. f. Overhead expenditures and profit, considering risk sharing procedures of the project implementation, maintenance and operation activities. Donors and the author’s experience indicate that having a reference unit cost analysis is useful to improve transparency, to attract national and international bidders and therefore reduce costs.9,10, 33 The authors recommend incorporating reference unit cost analysis to the bidding documents of the proposed accelerated road improvement and maintenance works, using either recipe or performance based specifications of construction or maintenance works. Pay Equation and Value Engineering principle: Donors and road agencies in LAC recognize that adequate properties and uniformity of materials and construction procedures are important quality characteristics needed to reduce construction, maintenance and vehicle operating (VOC) costs. Therefore, these agencies have used construction specifications that award adjusted payment appropriate for the level of quality received.7 to 12,17,31,32 This has led to the use of the term percent defective (PD), representing the portion of the construction or maintenance lot falling outside specification limits, as the statistical measure of quality. Where: PF= pay factor (percent); TPD= Thickness percent defective; DPD= Density percent defective; and RPD= Roughness percent defective. The proposed RQL of PD=15 for pavement smoothness is usually required to achieve surface roughness of less than 2.5 m/km for a new construction of asphalt pavement. The proposed RQL for thickness and density is defined as the average values that are more than 12 mm and 2.5 percent less than the design values of thickness and density, respectively. Equation (1) awards a maximum pay factor of 106 percent for pavement that is of clearly outstanding quality (zero percent defective for all three measures). In this case the highway agency and the road users receive more than comparable value in terms of the extended service life of pavement of this quality. 9,10 For pavement of varying levels of percent defective in the three quality measures, equation (1) assigns pay factors that range from the maximum of 106 percent down to a minimum of 60 percent. This minimum occurs when one of the three measures approaches its respective RQL or when a combination of the three measures results in the minimum pay factor of 60 percent. If the RQL value is reached on any one of the quality measures, the highway agency has the option to require removal and replacement of the defective pavement section or any other corrective action. If, for practical reasons, these options are not exercised, a minimum pay-factor of PF=60 is assigned. Another feature in equation (1) is the use of the second power of roughness percent defective. As a result, this term tends to exert greater influence so that relatively high levels of riding quality and lower VOC expenditures must be achieved in order for the contractor to benefit appreciably from the bonus provision. A distinctive feature of this acceptance procedure is that, provided none of the quality measures reaches its RQL value, it permits surpluses and deficiencies in thickness and density to offset one another. 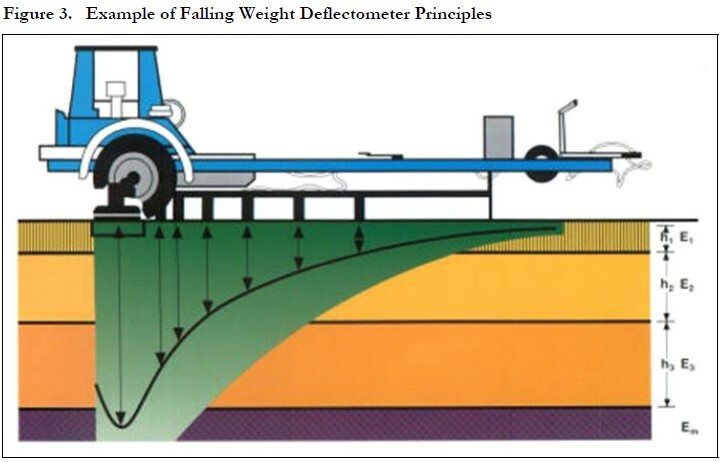 As an example, if a contractor cannot produce roughness percent defective (RPD) and density percent defective (DPD) of less than 12 percent he will have to deliver a thickness percent defective of less than 1 percent in order to meet the acceptable quality level (AQL) and the minimum pay factor of 60 percent. Financial sustainability considerations: Donors have concluded that most of the roads all over the world are owned and operated by different levels of governments.5,6,7,15,34,35 Most of these roads, except the toll roads, are not capable of being operated on a strictly commercial basis.35 Even the toll roads require a minimum amount of traffic in order to be commercially viable, and often governments secure minimum traffic volumes in road concession programs. As a result even in industrialized countries, toll roads account only for about 5% to 10% of the primary road network, which itself represents only about 10% to 20% of the overall road network, or toll roads account for less than 0.5% of the total road networks. Toll roads in the United States, for example, represent 0.08% of the paved roads. By and large the aim of all road administrations all over the world is to carry out the construction and maintenance of road works in a cost effective manner and try to recover from the road users as much revenue as possible to match the expenditure on roads. Motor vehicle tax and fuel tax are the two traditional sources of revenue. To the extent that the revenue from them is not adequate to meet the road expenditure, allocations are made from other general tax revenues of the country. Often a part of the revenues from the two sources are used for other purposes and only the remainder is allocated for the roads. To avoid this, many governments used to credit the fuel tax and vehicle tax to a separate Road Fund Account which would finance road maintenance expenses only. However, the more recent public finance practices of many governments do not seem to prefer this option on basis of greater flexibility of use of tax revenues. Therefore, the authors recommend incorporating the road financial sustainability issue into the institutional modernization study of the Cuban road authorities of MITRANS (see item 5 of Table 2). Institutional decentralization considerations: Lessons learned from LAC indicate that institutional decentralization of responsibilities is a useful tool in the administration of road systems.7,11,34 Road agencies depend on quality and quantity of information technology, and it is important to keep pace with technological developments. Decentralization does not mean that everything is delegated. Activities that are best performed at the central level need not be delegated to the district level. The principal advantages of a decentralized highway agency are: (a) better response to users and local community needs; (b) road investment and maintenance goals are adjusted to the local conditions of every district; (c) rational commitment of fund allocations; (d) effective and transparent distribution of allocated funds; (e) effective accountability and consistency procedures in monitoring and auditing the project. The authors recommend incorporating the institutional decentralization issue into the institutional modernization study of MITRANS. g. use modern financial systems for evaluating various available funding scenarios. The authors estimate that $500,000 and 9 months are needed to develop an institutional modernization and capacity building for MITRANS, see Table 2. 1. Establish an inter-institutional working group including the ministries of transport, finance, education, health; police; road users; insurance companies; affected communities and their school systems. 2. Develop a road accident database, including: police reports; accident costs (fatalities, injuries, damages); severity, frequency, location and cause of accidents; traffic volumes; road network and demographic characteristics; vehicle registration; emergency medical services; traffic court decisions. 3. Train and monitor the police force in road safety, and in using the database and digital forms for evaluating and reporting of road accidents. 4. Develop a public transport policy, including road safety planning and modern regulatory services. 5. Improve the driver licensing and vehicle safety codes code and strengthen the regulatory capacities. 6. Develop a road safety education curriculum for introduction into the schools’ systems at the primary, secondary and tertiary levels. 7. Carry out a quantitative engineering and a socio/ economic evaluation of critical road sections with the most frequent and the most severe accidents. 8. Design road improvement works with quantitative calculations of accident reductions (AR) factors. As an example, following the recommendations of the Departments of Transportation of Florida and Louisiana that were adjusted by the IADB and the Guyanese road agency:10, 36 AR=R1+(1–R1)*R2+(1–R1)*(1–R2)*R3+(1–R1)*(1–R2)* (1–R3)*R4+…. Where: R1=0.4–for road signing; R2=0.7–for marking; R3=0.3 for reflecting spikes; R4=0.2 for road lighting; R5=0.15 for sidewalk services; R6=0.22 for effective law enforcement; R7=0.34 for removal of bridge/culvert obstacles; R8=0.42 for proper traffic lights-signalization. The authors estimate that $1 M and 9 months are needed to carry out an accelerate road safety improvement study and implement urgent traffic signs and demarcation works, not included in the accelerated road improvement and maintenance works. Donors, national transport agencies and municipalities of medium and large cities give priority to the provision of safe and effective motorized and non motorized urban traffic services.37to39 Lessons learned of the WB, IADB, DFID, and from LAC and Asian cities, including Lima, Bogota, Pereira, Quito, Guayaquil, indicate that proper planning and administration of public transportation services is necessary to avert increase of pollution, accidents and overall congestions. The authors have concluded that relevant donors’ lessons learned applicable to major cities of the new Cuba, include: (a) design and implementation of rapid bus services (RBP), using an integrated strategy of urban transport planning, land use, road safety and air quality conservation; (b) design and implementation of a modern regulatory services of RBP; (c) Incorporation of low income users into the RBP system in terms of accessibility and affordability; (d) implementation of solid financing mechanisms of the RBP services to ensure long term sustainability, including progressive private sector participation in the operations and investment costs. o. consider that the total capital costs vary from $1.35 M/KM (Jakarta) to $8.2 M/ KM (Bogotá) and if affordable consider fares similar to those of pre-existing services. The authors estimate that the current low traffic demand in Havana and other major Cuban cities would increase significantly after the political transition and towards the establishment of a new Cuba. Considering that seventy percent of the Cuban population of 11.4 million already live in urban areas (2 million in Havana), and the current low level of income and automobile ownership, it is logical to assume that effective public transportation services would play an essential role in the socio economic development and competitiveness of the new Cuba. Therefore, the authors recommend carrying out a pilot integrated urban public transport study in two major cities to identify investment priorities in civil works, purchasing and operation of new buses. The authors estimate the cost of the RBP study at $900,000 and its implementation period at 9 months (see Table 2). Modernization of the Cuban road sector would reduce the transportation costs and support the new Cuban economic strategy to generate foreign exchange. The road modernization would probably support other social and economic savings including improvement of highway safety, implementing clean and cost effective urban and inter-urban rapid bus services, expansion of the pedestrian, bicycle and other non-motorized traffic services, and keeping low CO2 and other transportation related contaminants. Since 1989, investments in the Cuban road sector have been insufficient to maintain the road network in safe traveling conditions for the projected post conflict traffic demand. The authors estimate that after the transition period, urban and inter-urban priority roads and bridges would need significant investment and maintenance works. To accelerate the implementation of these works and to attract international donors such as the IADB and the WB, the authors recommend to use innovative engineering techniques including agile transportation asset management programs with full infrastructure inventories capabilities (pavements, drainage facilities, signs, lighting, guardrails, walls, bridges, painting, etc) that fit the AASHTO transportation asset management Guide of 2002 including cameras, PC, GPS, DMI, Video-GIS software and hardware for road network functional and structural evaluation (see Figure 1). The authors estimate that if the new Cuba would follow the latest declarations of Raúl Castro that Cuba is considering opening itself further to foreign investments, donors might consider to support the new Cuban road sector improvements of priority projects and could provide approximately $24.0 M for an accelerated 15–months road investment, maintenance and institutional modernization program proposed in Table 2. Lessons learn from accelerated road improvement and maintenance projects in LAC and Africa indicate that international donors could support a fast track road improvement and maintenance works, if the Cuban road agency would: (1) use the HDM-4 and the RMMS programs to develop road investment and maintenance programs; (2) modernize the road sector and demonstrate that the procurement procedures are effective and transparent; (3) implement modern design tools and QC/QA procedures to determine urgent needs of improvement and maintenance works and bridge works actually done. 1. The opinions expressed in this paper are those of the authors and do not represent the views of the U.S. Government.